Got into liver supportive food after a hospital stay ‘cause I wanted the drugs and anesthesia out of my system. Found it’s not so hard when they’re all foods you love anyway, so I’ve stuck to it. Cold water fish, brussell sprouts, broccoli, cabbage, kale, cauliflower, parsley, beets, chard, dandelion & mustard greens, artichokes, asparagus, carrots, oats, quinoa, flax, garlic, eggs, citrus, apples, berries…. Perfect for a farmers market denizen (go the extra $ mile and buy from the organic growers). Pure cranberry juice with a little lemon in the morning before breakfast (an alternative to coffee?) and pomegranate juice after dinner (my farmers market source says it’s the best time for it but I forgot why). Tumeric is supposed to be helpful, too. I’ve always enjoyed your recipes, so now you’re into pomegranates I’ll be looking for your take on Muhamarra. Nona - thank you for your kind comments. Pomegranate juice is particularly good now because the fruit is in season. My farmer's market has a vendor who sells freshly pressed, organic pomegranate juice. The taste is richer and more satisfying than bottled juice made from concentrate. I have been shopping organic and at farmer's markets since 1981 or so. My diet was never "perfect" but it always included lots of fresh produce and much less meat than the average American. I also enjoyed fresh grains, even quinoa, and had been eating them all my life. Diet is not the only factor in breast cancer - in fact research studies have not been able to find a strong link between diet and breast cancer. There are many other factors, most unknown; they are looking at light pollution; of course all the plastic in our lives, which contains hormone disruptors; and the many pesticides and toxic chemicals that contaminate our modern life. I do believe there is also an emotional component. The work of Carl Simonton and Bernie Siegel resonates with me. Oh by the way - I had been eating fresh-ground flax seed in yogurt with turmeric for at least the past two years. Now I take a gram of turmeric extract (curcuminoid) as a supplement daily. You might want to check this book. The author is a Ph.D. and a leading researcher on cancer, well known here in Canada and a colleague to my husband. His book was first published in French and is now available in English. In the book he mentions all the food you are eating now and mush more. By the way, did you see Atom Egoyan's 'Ararat' ? In the movie, Charles Aznavour holds throughout the movie a pomegranate. 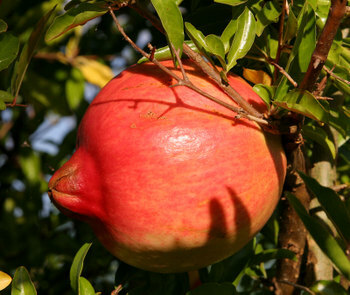 It is a beautiful fruit and I used to have one pomegranate tree in our garden in Lebanon. Moreover, I get to know Aleppo's cuisine from mys siter in law and did you know that they use unsweetened pomegranate syrup on practically everything, even on the kebbé. they also use it in salads to replace lemon juice. Sorry for the typo errors. It is 'much more' instead of 'mush more', and my 'sister-in-law' instead of 'mys siter in law'. Also by mentioning the author of the book I meant the first author.